It’s been a while since I did a book review, and I’m changing up the style a bit. The suns were fun and really great, but I found with a rating system of one through five suns that I wasn’t always able to accurately reflect how I felt about a particular work. In moving to a grading system (A+ through F), I can be much more precise about what does and does not work for me about a book and/or movie. So buckle up and enjoy because here we go again! I’ve reviewed short story collections before, but I tend to avoid them. Primarily because short stories are hard to write successfully. (I should know; I still write them.) The criteria is broad, but essentially there’s only one rule: tell the story quickly enough that the reader can finish it in one sitting. Do you know how difficult it is to grip a reader in ten pages or less? You can say too much and end up with a novella or say too little and the work falls flat. They say novel writing is an acquired skill; well, short story writing is a gift, the pinnacle of the art. A short story must not only capture your attention, but it must move you. It should leave you contemplating something by its end. This is not easily accomplished. 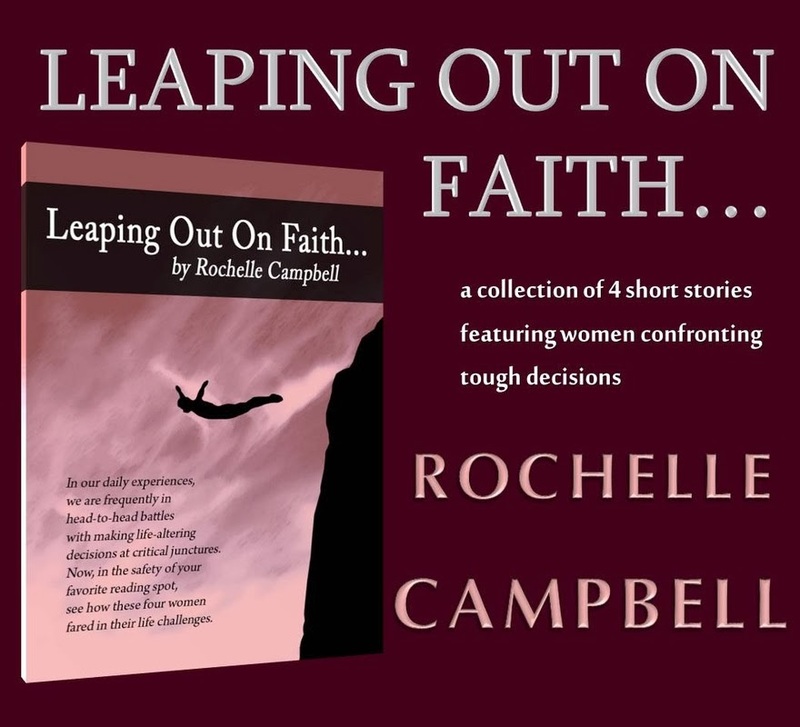 So it was with grave apprehension that I set out to read Leaping Out on Faith by Rochelle Campbell. The work is a compilation of four short stories, each about women in various stages of life facing major crossroad decisions. “The Green Years” introduces us to Sarah, a high school freshman grappling with a broken heart. The language is simple, and Sarah thinks the way a high schooler would, a credit to the author who captured the adolescent mind brilliantly in this story. But perhaps it was why I found it so difficult to identify with the young girl. Now in my thirties, high school feels so far away and its problems so trivial. Sally, however, turned out to be a woman I remember from days long past. There is nothing in the world like waking up in your fairy tale only to find that your nightmarish past has caught up with you. In “Chambray Curtains Blowing in the Wind”, the action plays out quickly and believably as Sally fights for her life and self-control. “Knocking at the Door” reveals a nameless heroine, but probably the most thought-provoking piece in the collection. As the stranger raps incessantly at the door, flashbacks of a love estranged plagues our heroine’s mind–and heart as she decides whether or not she should answer. Salera from “All God’s Men” must determine if love can truly outweigh religious and cultural differences, a question many women at some time or another must have answered. Ms. Campbell reveals not only her versatility in this work, as each setting is diverse and vivid, but also demonstrates her ability to draw the reader in with life situations that unwittingly cause us to question our own intentions and motives. Each tale the author weaves could easily be a situation in which any of us could find ourselves. We may not have made their decisions, but we have certainly thought those same thoughts. We have struggled with the same pain, and we have answered the same questions. I would have liked a subtitle. It would have assisted with knowing this book was a short story compilation rather than a novel. I could have done without “The Green Years”, and ultimately, it may have been better not to lead with this story. And I wanted more stories, a longer work. It is clear Ms. Campbell possesses the know-how; I simply wanted maybe two or three more stories to fill the compilation out more. I was pleasantly surprised by Leaping Out on Faith, and I’m glad I stepped out on mine to read it. I’m sure you will be, too.